The parts needed for building your own solar panel are easy to find and inexpensive as well. Knowing what it takes to assemble a working solar panel can save you a lot of time and help you get your solar power system online more quickly as well. 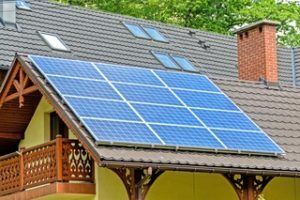 Solar power systems can provide a great alternative energy solution for your home and can generate most or even all of the power your home requires each day. These modern solar power systems are more efficient than ever before and require even less equipment to generate the power you need for your home. Most of the improvements with these home solar power systems are in the solar panels used to generate their power. These modern solar panels are able to generate far more solar power for homes from a given amount of sunlight than older panels and are more durable as well. Because these solar panels represent the largest part of the cost of these home solar power solutions, many homeowners try to build the solar panels used in their systems themselves to save money. Though cheaper, it is much safer to have a certified professional install your solar panels unless you have a working knowledge of electricity. If you do, all of the parts needed for a home solar power system installation project are easy to find online. These solar cells are available in several different types and they each have different efficiencies and costs associated with your choice between them. The most efficient type of solar cell is called a monocrystalline cell and is made from a single large silicon crystal. It can supply more current from a given amount of sunlight and is the most difficult to produce. The other common type of solar cell is a polycrystalline variety and this type of solar cell is made from smaller individual solar cells that are joined together to form a single larger cell. These are less expensive than the mono-crystalline cells and less efficient as well. Once you have chosen the type of solar cell to use, the next step in solar panel manufacturing is to mount a collection of these solar cells onto a strong backing material. Because the solar cells are fragile, this backing material is used to support them and allow them to be wired together in your system. Most of the solar cells you purchase come with wiring guides to help you connect them together into a functioning solar panel. You will have a few different choices on the wiring depending on what voltage you are expecting to produce. When the solar cells are wired in series you will create a higher voltage and when they are wired in parallel your current will be higher. 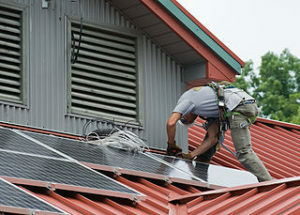 Usually most solar panel construction projects use a combination of series and parallel connections to provide the right balance between voltage and current for your completed solar panel. Once the mounting and connection of the solar cells is finished , the backing board is installed in a weatherproof enclosure. This enclosure will protect the fragile cells from the elements and allow the sunlight to penetrate the top of the cabinet to allow them to work. This is basically how your solar panel is constructed. You can visit this Moving company in Toledo that helps in moving your things from your old house to your new one. You can also ask if they accommodate transferring solar panels.